Rural Revolution: Are we in for a hard winter? Here in Idaho (as well as many other northern locations) they say we have three distinct seasons: Winter, After Winter, and Getting Ready for Winter. There's some truth to that. Old-timey folks wisdom is full of predictors for the weather, usually interpreting signs in the natural world (both plant and animal) to dictate whether we'll have a hard winter or not. Last winter most of the country was WHOMPED with one of the harshest cold seasons on record... yet north Idaho managed to escape the worst of it and we had just a regular winter. But we've had our share of nasty weather as well. A few years ago, we had two harsh winters in a row that illustrated with great clarity why a prepared lifestyle is a wise lifestyle. So when I saw Granny Miller's blog post on a hornet nest winter forecast, it got me thinking about our winter preps. We have a lot we want to do before the snow flies, but here's what we've got done so far. 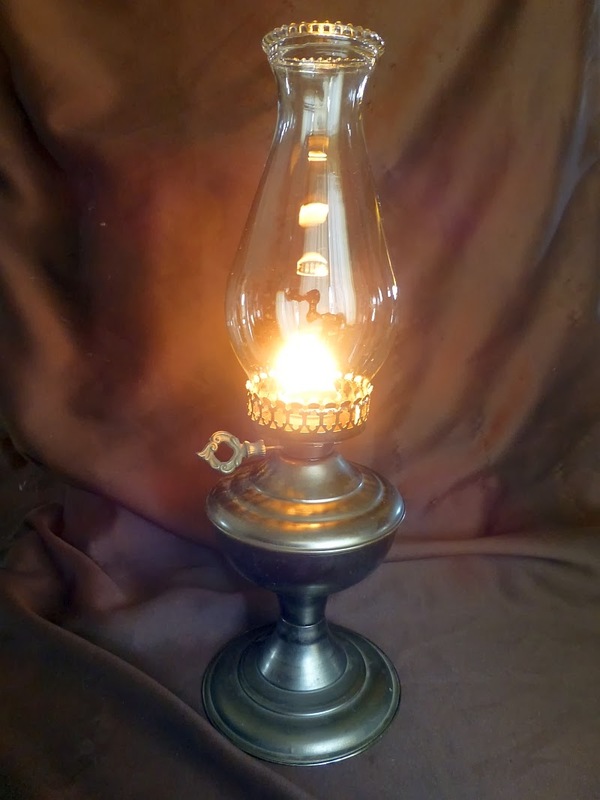 We have oil lamps primed and on standby, as well as a generous supply of kerosene. We have about 40 gallons of stored water on hand (no photo, sorry). We have lots of firewood. We have our hay in. The livestock have shelter from the barn awning. The chicken coop is now insulated. • We want to build feed boxes for the cattle under the awning. 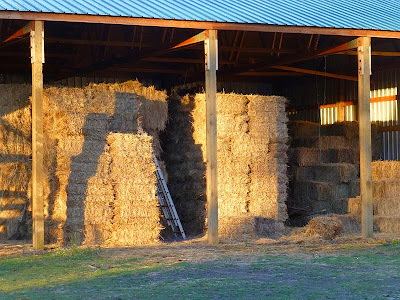 This will keep hay from being wasted as much, and will keep debris from building up as fast. • We want to build an above-ground root cellar out of a pen in the barn. We anticipate a heavy crop of potatoes and don't really have an adequate way to store them. Our house doesn't have a basement and digging underground involves a lot more logistics than we're willing to put in at the moment, but retrofitting a pen with heavy insulation is more do-able. • I want to do a lot more canning. A lot more. • Don wants to drop several more dead trees and cut them up for firewood. Not only will this reduce the chances of losing other trees to insect damage, but it will provide additional firewood. • We'll need to blow out and put away part of the drip irrigation system in the garden. • We want to build an extension to the bull pen shed. Our current shed is kinda cozy (read: small) and having additional room will allow the animals to over-winter more comfortably. • We want to install guttering on the barn awning. Currently water just dumps down the awning and creates horrifically muddy conditions. Guttering will funnel the water away and make the bull pen and feedlot much less sticky. • We want to buy a ton of chicken feed. Yes, literally. We found a source of bulk feed where the feed comes in thousand-pound bags. The cost is half what we're currently paying for 50-lb bags, and it means we won't run out of chicken feed in the middle of a blizzard. However we'll have to build rodent-proof bin before we can buy the bulk feed. • We'll make sure to have plenty of food on hand, both for us and for our pets. For example we always try to keep two bags of dog food ahead of what we're using, just in case. • We'll top off our propane tanks. As you can see, plenty to do before the snow flies! But since it's not yet September, we'll have about two full months (maybe more, if the weather cooperates) to get these tasks done. We'll prioritize as we go, and the least important (or the least do-able) will get put off until next year. Yep, we're in the season of Getting Ready for Winter. We must be in north Idaho. What are your winterizing plans? My brother-in-law stores his chicken feed in some old, unusable chest freezers for rodent-free storage; and also free-for-the-hauling-away. In MN the two seasons are winter and road construction. I'm in southwestern Idaho. What signs do you see that it will be a harsh winter? We just purchased 10 acres, small home, large barn and are slowly making the move from NorCal to be there by next year. I live in the San Joaquin Valley in CA. Our seasons are: blistering heat and fog. I am working to cut down the thick blanket of weeds and frass that took over my 20 raised beds, reducing that number by half and making the remainder a little taller so I can both walk in the garden and handle the gardening without falling down. I will be pruning my fruit trees and a couple of decorative ones as well. I hope to extend my drip irrigation and replace all that has been lost to 108 degrees and drought. Man, I'm so sorry to hear about your losses because of the drought. Re: San Joaquin Valley-we're in the foothills east of Stockton. Worse case scenario is we'll let the grass go and bushes but will water our fruit, nut and landscape trees as they'd be expensive to replace. Also will continue winter garden to feed us until next year when we leave (and chickens-for eggs). Guess I'll be washing my car with Idaho's water. The one thing I do now to save money on chicken feed is to ferment it. You don't need anything fancy, just put some feed in a bucket, cover it with water, and stir. Let it sit two or three days (depending on temps.) till it gets small bubbles on top and smells "yeasty". The hotter it is, the faster this will happen. Then scoop out what you need (drained) and add more feed and lots more water after their second feeding of the day. Apparently this breaks down the enzymes that protect seeds from being digested when it is in the digestive track of animals allowing the animal to get more of the nutrition out of the grain. Fermenting my chicken's food has cut their consumption 1/3 to 1/2 of what I was feeding. Right now I have two separate buckets that I take feed from. In the winter I will have to pull the feed indoors to keep it from freezing and I may have to go to three buckets working due to cold temps. Cons- This is a twice a day system, so basically you have to be around during feeding time. If I leave for the evening, I will throw their old feeder and some dry food back out. They don't like it, but if their hungry they will eat it. It's an extra step to feeding. I highly recommend people trying this! I have 17 adults and the bag of feed I am currently using was opened on the the 6th and I still have a third of the bag left plus what is in the buckets. Also I don't recommend doing this with medicated food, it smelled really weird. This really caught my attention. Thank you! I'd be thrilled if this could be adapted for my sheep, and I'll be talking to their Doc about it forthwith. I'm certain it would take a gradual changeover for them, but it sure would be nice to know they're getting a more efficient 'fuel burn' through the winter. I don't know about that element of less poop....how ever would I cope? LOL! We are working on winterizing here as well. In upstate NY we get cold, snowy winters fairly regularly... and I'm pretty sure this one is going to slam us again this year. We have canadian geese that have been parked on our lawn for the past 2 weeks. A clear sign fall is very very close at hand. We also had a "visitor" (read FOX) stop by for a visit at our chicken coup this past week. All signs winter is close behind. So, we finished building our "new" chicken coup from a recycles rabbit hutch. Really it is more impressive than it sounds, 3 levels high, with a peaked roof made from sliding glass doors to let in as much light as possible in those dreary months (and we will add heat lamps). We penned off a 25'x25' run for the layers and are lining the perimeter with electric fence for our fox friend to enjoy. We butcher our last 64 freedom ranger broilers this weekend to fill our freezers. We are repurposing some materials to make a pig hutch to keep our pig out of the winter weather. He has a good coat, but needs to be out of the wind/rain/snow. We have had many house projects going on this year to fix the damage caused by the previous owners um, lack of common sense. So we are putting the siding back on the house, insulating where there is now walls instead of sliding glass doors. We are trying to make the home as tight as possible to keep from loosing $$ on heating. Our home is 1600sq ft and not very old (like 15 years old), so we shouldn't have such a drain on heat costs. So we spent the money and hired my brother to split our heat into 2 loops to loose less heat, and not have to reheat the water so high. We are still really considering a pellet stove or installing a wood stove to cut costs as well. We aren't sold yet on either. But we have fixed all the rotten holes in the walls and that should be a major help along with removing 2 giant sliding glass doors and replacing them with much more energy efficient options. We still have to pressure wash the house and stain the deck and seal it. We are also putting in a new concrete walkway to the house for easier snow removal in the winter time. We have a lot of canning to do but I am trying desperately to hold out for cooler weather. We have frozen all our berries for jam. Tomatoes and cucumbers are knocking at our door though. I just made a huge batch of bone broth, but froze it instead of canned it because it is just still too hot to can. Can you pressure can on an electric glass top stove? I didn't think you could, but I had to ask. We need to get wood if we are going to heat with it. There is so much that needs to be done in such a short time!! Did I mention having a baby? Yeah... that's part of getting ready for winter here too. Ha ha ha! Have a blessed day Patrice! Try having 2 giant sliding glass doors in a 2 bed 2 bath 1000 sq ft condo in Phoenix, AZ. I have large heavy curtains on both of them but you can still feel the heat coming through. The doggy door goes in one so I don't mind that one but did they really need a second one in such a small space? They are a huge security risk as well. I've pounded 3 large wooden dowels into both doors to hold them closed as I don't use either one. I also screwed brackets into them to foil somebody trying to lift them out. Remember, a pellet stove won't work during a power outage. I expect a winter here in SW Idaho to be cold -20 F. after Jan. but I'm unsure if it will be wet or dry. I had a major score on bartering this spring and got about 5 cords of elm split and stacked for winter. Bought all the prime ribs for holiday meals but I still haven't found turkey at a good price. Sept. I'll have the wood stove/chimney cleaned. I want to get one of those fire wood holders for the front porch. Planting some grass I hope will come up next spring and working on the compost pile. This year I'm in very good shape for the start of winter. I always enjoy your photographs but you really outdid yourself this time. This one is gorgeous! Will your gutter system on the barn/shed include a way to store the melt-off next spring? What a good way to store garden-watering water. I've been making pickled eggs with my extras this year and have ten dozen put away. They are considered a delicacy down here and I figure what we don't eat, I can easily barter with. I've also been canning anything and everything that will stand still long enough. I've got to get a load of wood in and this weekend, I'm planting the winter garden (year round growing conditions here) and getting the window covers ready. I've got my lamps filled and wicked and ready to go. I need to get in some extra water and I think I'll be good for the time of hibernation when it gets here. Luckily we're still in full summer here (daytime temps in the 90s) so I've got a good bit of time to work on it. Patrice, there is a place in Hayden, right off hwy 95, on the west side if you are driving north, that sells all sorts of barrels. The barrels only have had food products in them. They are very reasonably priced. That is what we store our chicken feed in as we don't have an indoor area for them and it keeps well. We buy a years worth of feed at a time. If you don't get a bin made that could be a good alternative. You can always use the barrels for something, or sell them once you have a bin made. Ruth, you must live close t me. I live in central PA. I'm dragging out the window quilts, etc this weekend as Fall isn't far behind. Got my woodshed refilled last weekend. Garden is about finished. So much to do; so little time. We're north of you by a few hours. What is this extensive winter preparation of which you speak? We'll drain the above-ground PVC pipes that carry water in the barn and to the livestock when the temps are going to drop into the 20s overnight, buy a couple round bales of hay for the sheep and plant some winter rye grass, and butcher all the excess chickens and ducks so we don't have to feed them once bug season ends. Oh, wait. Bug season NEVER ends here! Once bug season abates somewhat. Unfortunately, my mother's cancer is back, and I'm now caring for daughter's four children (one an infant). No lovely fall garden or food preservation for me this year. Spending time with my mom and watching the youngest (and last) granddaughter discovering her feet and fingers is way more important now. (wince) Prayers for your mom's remission, SwampWoman. Prayers from me, too, Swamp Woman. Stay warm. I live in Arizona. We get ready to crawl out of our air conditioned homes, and finally enjoy the great outdoors! I am not sure I've ever commented before, but I have read for a long time. Wanted to chime in with a quick tip on rodent-proofing feed. My father-in-law uses an old, large metal chest freezer that has a latching lid to store his horse feed. The freezer is no longer operable, and I believe he got it for free (since it doesn't work), but it works like a charm at keep rodents out of the feed! Perhaps you could find something like that for your bulk chicken feed, and it would save you the trouble of building something! Ooops, did not read other comments before posting mine about the chest freezer. Sorry! Great lists and yes, we are in for a hard winter. Not just this winter, but probably for the next couple of years. Volcanoes erupting. As. we. speak. This lasts years. If you don't get your root cellar dug, you can always pressure can those potatoes. I use quart jars, You preboil them for a bit (release some of the water) but be careful how much you pack into jars. You have to leave space. There's instructions on the interwebz. Also, you can pressure can beef. Those tougher cuts of meat, trim off fat, and stuff into jars. once that's done, if you need a quick supper you have precooked potatoes that can be dumped into a frying pan with precooked beef, with some seasonings and liquid you have a meal. my kids prefer potatoes this way because they call those purchased dehydrated potatoes "fake potatoes". You can easily mash them too. That's interesting information above about the fermented chicken feed. I regulary feed birdseed and grass clippings during summer months to cut down on feed costs. And also you can pressure can eggs, or freeze them. How do you pressure can eggs? Haven't heard of that one before, but I'm willing to try anything once. Do tell. but I believe there's a disclaimer about it. Like an at your own risk kind of thing. The smarter than us people say you shouldn't do it. but the book is good info about canning extra cheese and such. I also think she has a website. I haven't done it myself, because my egg supply dried up when the rodents moved in, but I believe it's like an omelet in a jar. I would be interested in hearing what SouthernProletariat thinks is in store for the Panhandle of Texas. I've been trying to figure out what our winter may be like. Great post. So much to do. Yes, I think this winter will be at least as bad as last winter - it was bad where I am - and I'm scared. We don't have a wood burner. So, we cross our fingers, do some of the same things you're doing, say a prayer, and hope for the best. If you store a lot of chicken food using non metal container put it on legs about 2 1/2 feet high minimum and add plastic skirts to prevent rodents from climbing up the legs. A bit like old cornstones worked. We have a plywood hopper reinforced with a 2 x 4 frame and a gate at the bottom to get the days rations. That way all the old food is used first regardless of when you top up. I wouldnt feed fermented ck feed to meat birds. It will affect the quality of meat and not in a good way. Ensile fed beef tastes different than grain/grass fed beef. Its almost sour. Saving $ is one thing but not if your result is lower quality. Its feed companies that push commercial feed for livestock. Think outside the box. A sizeable HoneyDo list that Don and Pat!!! been told it is an el nino year and to expect a more bitter winter than last year. great deal more attention. I'll probably be back again to read through more, thanks for the information!